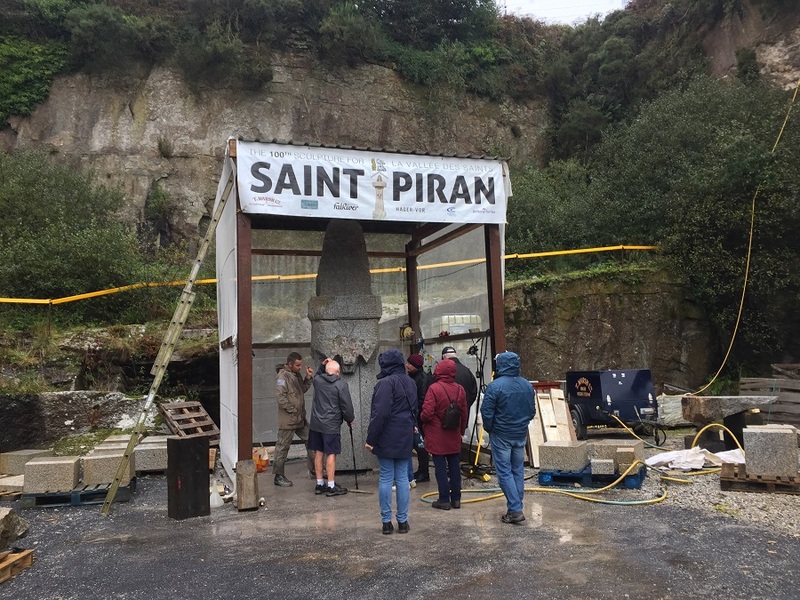 When I heard about the giant sculpture of Saint Piran that’s being carved in a quarry just outside Mabe, I was intrigued: I had to go and take a look. Cornwall has had more than its fair share of saints. It has been said that Cornwall boasts more saints than were ever enthroned in heaven! During the 5th and 6th centuries, Celtic missionaries arrived from Wales and Ireland, settled on the shores of Cornwall, and began converting small local groups of people to Christianity. Most of these missionaries established a cell or church near sites that were already in use for religion – places like holy wells, springs, standing stones or shrines. Although many of these men were never officially designated saints by the church in later years, their names live on with the designation ‘saint’ in over 200 old Cornish churches. Legend and reality became confused in the telling of the stories. Various saints were credited with arriving floating on such diverse craft as a millstone, a barrel or a stone altar. Many were reported to have embarked on stone throwing contests with Cornish giants, which the saints invariably won thanks to divine intervention. The names of some of these saints can still be seen in present day town names, like St Austell or St Germans. St Piran, the patron saint of miners, is probably the best known. He is reported to have unnerved the tribal kings of his native Ireland by performing miraculous deeds. They grew afraid of his power and influence and put a millstone around his neck and threw him from a high cliff into the sea. As he reached the water the storm abated and he floated on the millstone safely to arrive at Perranporth on the North Cornish coast. He built a chapel in the sand dunes, where his Oratory now lies buried beneath the sand. Every year on St Piran’s Day (5th March), people march across the dunes to the granite St Piran’s Cross to watch a play performed by St Piran’s Trust. They are dressed in black, gold and white and carry the Cornish flag – a white cross on a black background, said to represent white tin streaming out of black rock. St Piran is about to be celebrated again whilst forging links with our Celtic neighbours in Ireland and Brittany. A 3.5m high granite carving of St Piran is being carved here in Cornwall, in one of the last working granite quarries. 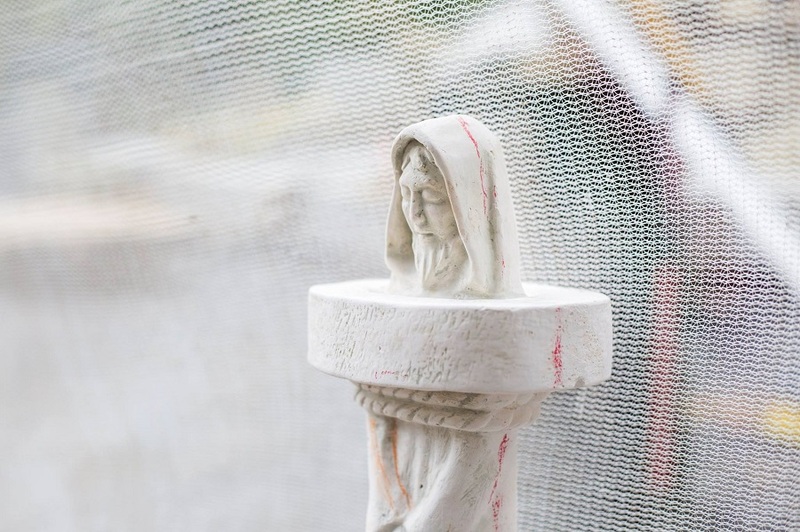 It will be transported by a flotilla of French boats to the Vallée des Saints in Brittany, where French sculptors have been working on an art installation of huge granite statues depicting Celtic saints. 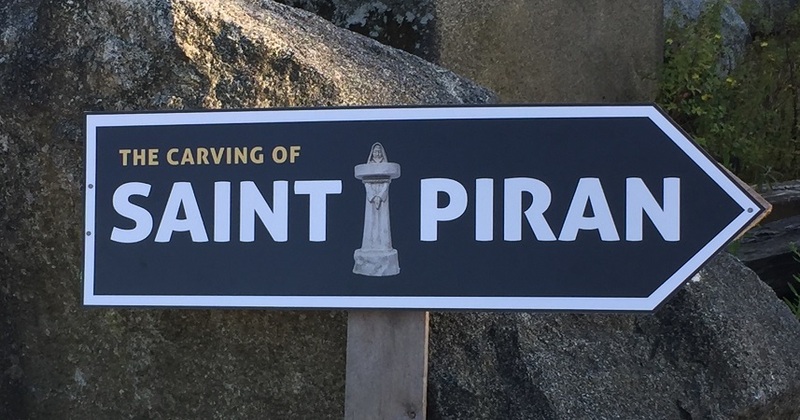 St Piran will be the 100th sculpture to be added, celebrating the 10th anniversary of the project. The 11 tonne granite block is being carved in Trenoweth Quarry, Mabe (near Falmouth), by sculptors David Paton and Stephane Rouget. You can follow its progress on their Facebook page, The Giants’ Crossing. The millstone base will be made from Breton granite and the middle ring around the body will be carved from Irish granite. Carved on the base will be the words, Oh God, my boat is so small and the ocean so big. 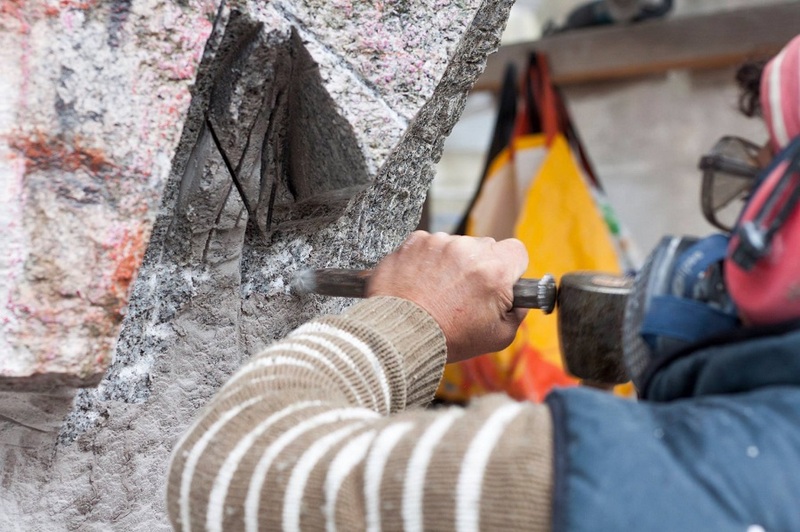 For the sculptors, it’s a wonderful way to celebrate the strength, quality and beauty of Cornish granite from local quarries. 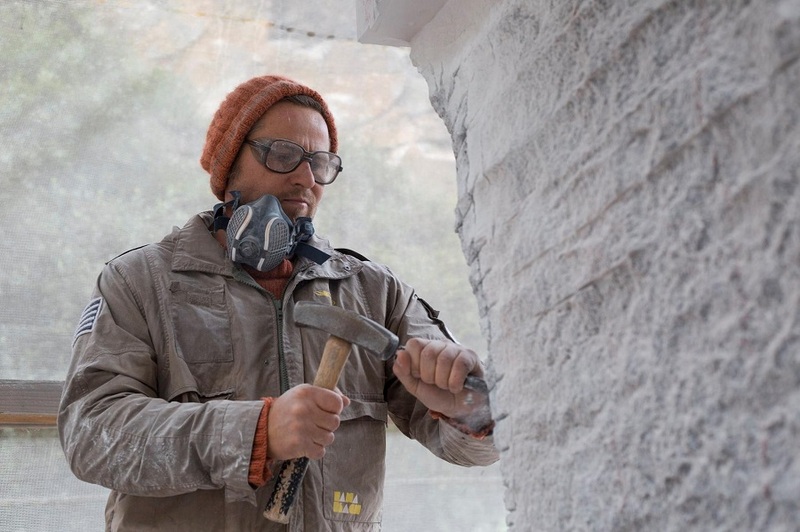 The whole process, from the legend to the artists, quarrying to sculpting, sailing across from Falmouth to France, to being installed in La Vallée des Saints, celebrates and enriches the ancient Celtic connections between Cornwall and Brittany. I was thrilled to see the beautiful Cornish granite and traditional hand carving skills of stone masons here in Cornwall being celebrated in this age of mechanisation. Stephane’s energy and enthusiasm for his craft and acknowledging our Celtic traditions was inspiring. Do pay them a visit whilst you can. There are two more open days to visit the quarry, see the carving and chat to the sculptors – Saturday 4 November and Saturday 2 December. After that, the statue will be finished ready for the transportation via a flotilla of French boats from Falmouth to Brittany on 6 May 2018. Two weeks prior to that, the statue will be on display at Discovery Quay outside the Maritime Museum in Falmouth. You can visit the carving of St Piran at Trenoweth Quarry, just outside Mabe Burnthouse (near Penryn). Postcode for SatNavs: TR10 9HY. There is a car park where you drive in and signs to the quarry and carving site. Wear boots or wellies.